Both the above map and the aerial photograph below shows the extent of the forestation, the aerial photograph also illustrates the amount of de-forestation that is currently occurring. The prehistoric features found in the area date back to the Bronze Age which makes them around 4,000 years old. Before we begin the serious stuff, I have noticed from the 3D map that the plateau formed by Lakehead Hill and Bellever forms a near perfect likeness of a arrowhead which points due north as shown by the yellow line above. Very, very near the centre of the shape are the two main cairns (Numbers 4 and 7) – weird isn’t it? Due to the size of the area I will divide it into two web pages, ‘Prehistoric Lakehead Hill and Bellever’ and ‘Laughter Tor‘. As always the actual place-name is the initial starting point and in this case the first mention of Bellever was Welford which appeared in a Duchy of Cornwall record of 1355. This was appertaining to the farm and is thought to have been a compound of wielle and ford. In Devon dialect it is often seen that the w and v get confused and the v and b interchanged. The tor is probably named after the nearby Bellever Farm, Gover et al, 1992, p.192. However, there is the theory that Bellaford derived from the first element being Bal (mine) and the second Ford, thus giving – ‘mine by the ford’, Hemery, 1983, p.486. To add a little more confusion, the early topographical writers presume that the place-name derived from the word Baal, this being, along with Belus, the name of the an ancient sun god, Page, 1895, p166. When seen in this light it was assumed that the tor would have been a place to worship the god – Baal. Considering the number of early ritual remains in the area there surely was something sacred about the landscape? The first mention of Lakehead Hill was in 1347 where it appeared as Lakehevede which is taken to mean ‘Stream Head’, Gover et al, 1992, p.199. This could allude to the small streams which start their life on and around the hill. Page is obviously describing Kraps Rings which today would be described as a settlement with nine hut circles inside the wall (not eight) and one outside (as Page noted). It was in the late 1800’s that the Bellever became known as the ‘Ancient Metropolis of the Moor’ by the early writers. The map below shows the main prehistoric features to be found on and around Lakehead Hill. The map has been adapted from Butler, 1991, p.49 and the descriptions from pp. 43-44, 48 – 51. If you click on the feature it will take you to a photograph of the feature that will appear in a separate window. This is the only settlement that has been relatively undisturbed by the forestation of Bellever. A plan of 1891 shows 15 huts enclosed by the ring wall of which 11 are discernable today. It is thought that the original enclosure wall would have been about 2m thick and over 1m high. The huts vary in circumference from 3.0 – 5.5m and are considered as being small to medium sized in Dartmoor standards. The Dartmoor Excavation Committee excavated the huts in 1895 when all but one hut was found to have been ‘dug over’. In the intact hut the antiquarians found a cooking hole and hearth. One other larger hut stands outside the enclosure wall. Cairn and retaining circle – This cairn has a retaining circle of 13 kerb-set visible stones and has a circumference of 6.0m. Much of the cairn has been removed and some has been deposited outside the circle. Cairn – This cairn has been completely despoiled, all that remains today is the kistvaen. Burnard excavated the ruined kist in 1898 when on initial inspection all the contents had been looted. However, when digging down through the floor he discovered many artefacts including six flint knives and scarpers, numerous sherd of pottery from at least two vessels, one of which was of a decorated beaker type. He also discovered wood charcoal but there were no human remains. Stone Row – Today there are only 12 stones standing in the row, there are spaces for 3 or 4 missing ones. The alignment is almost east/west and it appears as if some time in the past the stone row has been poorly re-erected by some early antiquarian. Circle, kist and stone row – Now covered by trees this monument consists of a retaining circle of six remaining stones. These encircle a kist of five slabs which are topped by a massive capstone. A row runs downhill from the kist and shows evidence of 11 stones although there was socket holes where two more stones would have stood. 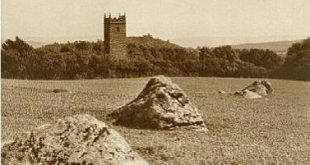 The Dartmoor Exploration Committee restored the circle, kist and row in 1895 and it was thought that their interpretation was fairly inaccurate there were no finds in the kist. Stone Circle – Consisting of 10 erect stones with spaces for another 3 – 4 slabs, its circumference is 6.8m. There appears to have been no central kist although to the south-east 3 or 4 slabs possibly indicate the one-time presence of a stone row. Stone Circle – This circle has a circumference of 5.6m and consists of 10 slabs and a central kist covered by its covering stone. This kist was excavated by the Dartmoor Exploration Committee in 1896 but nothing was discovered. Cairn – This has been very badly damaged but was estimated to have measured about 19 x 0.9m. The large kist has only two side slabs left with a possible further one lying nearby. Cairn – Another badly damaged cairn with a kist comprising of two side and one end slabs. This was excavated in 1914 but nothing was found apart from some charcoal which came from the infill and a shallow pit below floor level of the kist. The photograph below shows the southern aspect looking down from Lakehead Hill, as can be seen Bellever tor is the main focus from the hill and could have been seen from all of the above features. A lot of exploration and excavation was done between 1895 and 1896 and recorded in the Transactions of the Devonshire Association but the planting of the trees has made the identification of some of these sights hard to locate. There is no doubt that somewhere in the forest are the ‘hidden’ remains of these features, hopefully as the trees are felled they may be re-discovered. Although in some cases it is too late, the photograph below clearly shows the remnants of a wall curving away under the stumps of recently felled trees. There is no way that we can tell what this feature was without a great deal of investigation. Just to lower the tone somewhat, Lakehead Hill was always thought to have been the haunt of the piskies as Tom White found out, and on its western edge the ‘Hairy Hands‘. Could these supernatural connections in the Lakehead Hill area be a vestige of the sacred ritual associations of early man? If Lakehead Hill was the ritual centre of the ‘metropolis’ then Bellever was the residential quarter. To the north of the tor are the remains of a farmstead and its associated fields. It takes on a rosette shaped development with the huts and smaller fields placed centrally and then the larger fields progressing outwards. There are three huts within the enclosure, the largest of which has a circumference of 7.0m. This is connected to a smaller which measures 5.5m and still has the door jams visible. The third hut is located inside a paddock to the east and its circumference measures 6.5m. Butler, 1997, p.142, estimates that the population of this farmstead would have been around 8 people. Just to the north-east of the settlement are the boundary banks of two more field systems but the rest of the enclosure is lost amongst the trees. On the western slopes of of Bellever tor are the remains of another enclosure that may have contained a couple of huts. Sadly, most of the stones have gone and if you look at the newtake wall it does not take much guessing as to where they went. On the north west slope of Bellever tor was a rock shelter which the NMR lists as a ‘rock shelter’ and is dated to the later prehistoric period. The shelter was excavated in 1913 by George French and Robert Burnard and is described as , “narrow cleft between two large boulders.” It measured 10 feet long and about 4 feet wide and was blocked at its north-western end by a stone wall. The entrance had a large boulder placed centrally with an allowance for entry to be gained on either side. The excavations revealed a cooking hole in the floor and around 66 worked flints comprising of mainly flints but including a borer and a notched scraper (ADS Record ID – NMR_NATINV-442744). There are also several cairn and cists around Bellever tor, most of which are to the south-west. Once again many of the stones have been robbed from the cairns and now sit in the various newtake walls. It is interesting to note that the prehistoric features in this area comprise solely of burial cairns and kists, there is no evidence of stone rows or circles. This could imply that for some reason the Bellever Tor area was purely used for interring the dead and no ritual monuments such as rows or circles were used. Probably the best preserved of the cairns, it was recorded in 1890 the cairn had been dug into and the kist rifled. At this time the retaining circle was described as being in fair condition but today only 3 stones remain. In 1901 the spoil inside the kist was examined by the Dartmoor Exploration Committee but was found devoid of any artefacts. There is some question as to whether this is a cairn or not but Butler, p.52, considers that at one time it may have been a cairn with a retaining circle. The other possibilities are that the stones are a natural feature or a clearance cairn. There are vestiges of a retaining circle in the form of two pairs on stones on opposite sides of the kist. The kist is in good condition with only its covering slab missing, once again evidence of it being rifled. This is a ring cairn which now measures about 11 metres across and stand roughly 0.5 metres high which surrounds a slightly raised interior. This cairn stands at about 1 metre high and surprisingly shows no evidence of an associated kist. There are 7 stones of a retaining circle still standing, the kist has been damaged with one end slab and a side slab missing. Another dubious cairn which shows evidence of a modern trench and stone removal. A report of 1890 listed this cairn and cist as being imperfect and today just a few strewn stones bear witness to the feature that once existed. Comprising of a low mound this cairn still has its central kist with all four lining slabs in-situ, the covering slab however is missing. Now totally despoiled apart from one single lining slab of the kist. With all these old graves and rows and circles it should not come as a surprise that legends of piskies, ghosts and other unearthly creatures have become attached to the area. Bellever Tor has been for centuries renown as a meeting place for the piskies. There is the story of Tom White becoming pixie led, the legend of the Bellever Hobbyhorse and not forgetting the notorious ‘Hairy Hands‘. Butler, J. 1991 Dartmoor Atlas of Antiquities, Devon Books, Exeter. Page, J. Ll. W, 1895 An Exploration of Dartmoor, Seeley & Co., London.